Specialized software is the key tool to help the mind doing research in mathematics. At the same time mathematical software bridges the gap between the diverse fields of mathematics and their application areas. 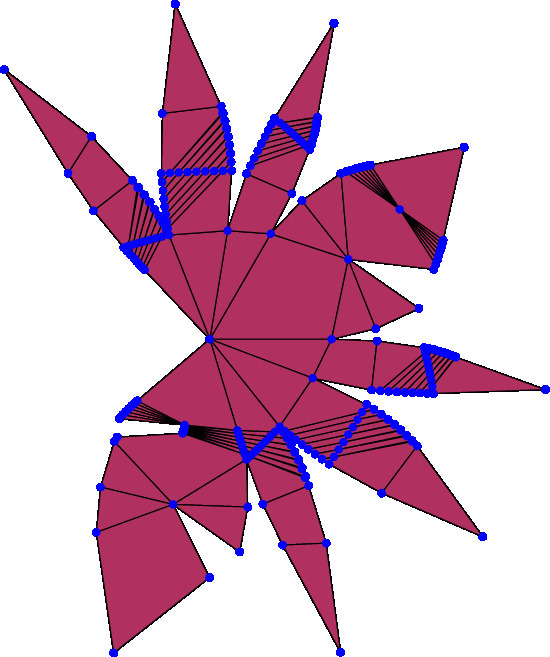 polymake is a software system for convex polytopes, simplicial complexes, and more. Co-authored with Ewgenij Gawrilow (now TomTom) and actively supported by many people [BibTeX-Entry]. If you are interested to see how polymake can be used, see the documentation or this extra page with references. This is a long term project first released in 1997. Get an idea of how to use the system from the polymake Miscellanea. Look up polymake at swMATH. The polymake release 3.2 (from January 2018) is available as a Debian package. There are also packages for, e.g., Ubuntu, Arch Linux and other Linux systems. This is a brandnew parallel implementation of the down-flip reverse search algorithm for enumerating the (regular) triangulations of a point set. Co-authored with Skip Jordan and Lars Kastner. Our arXiv preprint explains the method and reports on experimental results. Release of version 1.0 on March 28, 2018. This small polymake side project is an educational game, which lets you play with 3-dimensional polytopes and their unfoldings. Co-authored with Georg Loho, Benjamin Lorenz and Rico Raber in 2016 and presented at SoCG 2017. MatchTheNet is part of Imaginary. We are currently developing a new computer algebra system, called "OSCAR". It is written in Julia, and it combines GAP, Singular, polymake and Antic. In order to run the above: (1) Use Linux or MacOS; Windows 10 may work with the Linux subsystem. (2) Download polymake snapshot (from Nov 16, 2018 or later), build and install into, e.g., "/installed/at". (3) Then set "export POLYMAKE_CONFIG=/installed/at/bin/polymake-config" and possibly also "export LD_LIBRARY_PATH=/installed/at/lib:". Add package Polymake.jl to julia and build. Then proceed, e.g., with the notebook above. A new collection of geometric models. This is a small program which computes real representations of quasi-simple Lie groups. It is quite old but still functional and occasionally useful. Joint work with Richard Bödi.